In a small college town in Pennsylvania the lives of a bigamist's wife, a Polish orphan, an ex-priest and his wife—a former nun—and a mute teenage runaway intersect. The Season of Lost Children explores the question of what constitutes family and finds that the answer is often closer than we think, if only we look with and within our hearts. The Season of Lost Children can be enjoyed on its own, but is also part of The Fenston Trilogy, which traces fifty years of the interwoven lives and friendship of three women in a bucolic Pennsylvania college town. While The Season of Lost Children focuses on the life of the eccentric former nun, Eleanor Roderi, A Trick of Light chronicles the heartbreaking discovery and redemption of Hattie Darling, the only daughter of the town's first family. At the time of Karen's death on August 15, 2012 the third novel in the trilogy, I'm Still Me, was unfinished. "This is the second book in a planned trilogy. Both this and the first (A Trick of Light) take the very "tricky" topic of bigamy and weave it into a story of great insight and character development as they delve into very real portrayals of human nature. The interaction of the characters over a period of time allows the reader to become acquainted as if friends. The connection is strong and I eagerly await the third book to see how the tension and story resolve.The book has humor, pathos, love, hate, connection, friendship and family—all the components of a really good story." "Karen Blomain's The Season of Lost Children features engaging, thought provoking and sometimes quirky characters who reveal their sensitive stories with more twists and turns than many popular mysteries. Blomain's fertile imagination had me wondering who would show up next, where, with whom and why in a fast moving plot that never slowed. Herr poetic and highly visual descriptions painted detailed word pictures. If I had highlighted all the phrases and metaphors I wanted to read again, I would have underlined half the book. 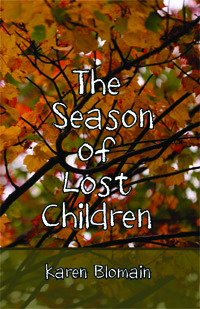 I started with this second book in her Fenston Trilogy and it was no problem....Season of Lost Children is a GREAT read!" "I was drawn into this story immediately. The opening scene is really quite a brilliant way to introduce so many themes in such a concrete, sensual way—past and present, attitudes toward body, guilt and cleansing, faith and doubt. Quite a lovely jumping off place for the story. The characters are real, their struggles are our struggles. Blomain has the ability to bring scenes alive with textured sights, sounds, smells, and she has an ear for dialogue and interior thoughts that rings through in every scene....You won't regret your journey to Fenston, PA to get to know these engaging people and their intriguing lives—I certainly didn't." "The complex characters in The Season of Lost Children ring true with their foibles, longings, and friendships and a vivid sense of places anchors the story. The writing is very good—sometimes lyrical, always easy. The scope of the book is ambitious and in Blomain's hands works our to a fulfilling story."